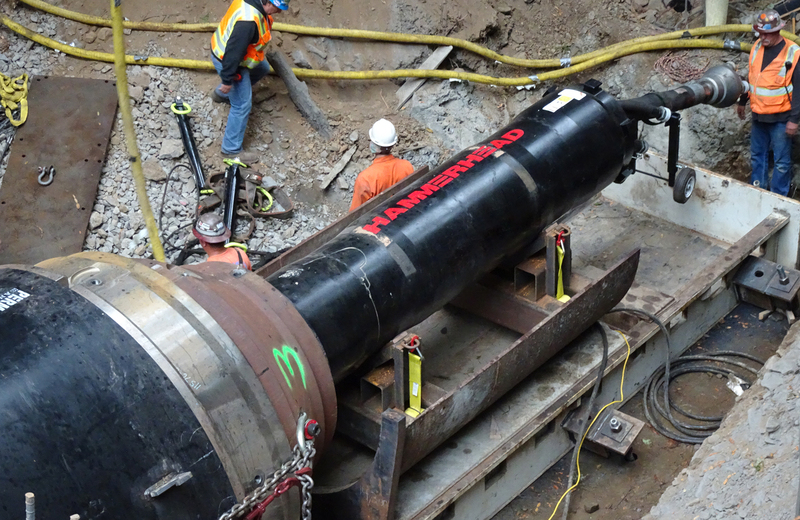 More and more contractors are utilizing pneumatic tool pipe ramming for critical grade, large diameter, medium distance bores. Accu-Pipe Ramming Systems, Inc. recently accomplished a difficult subcontracted ramming project in Grand Prairie, Alberta, that earned them another notch on their belt for accurate ramming of steel casing. While ramming a 30-inch casing 144 feet in hard-packed clay, they hit their mark a mere 10 millimeters off their desired grade, a distance the size of a small rock on top of the pipe. Accu-Pipe Ramming Systems, Inc. has offices in Red Deer, Alberta, and Regina, Saskatchewan, fielding requests from general contractors in North Dakota, Alberta and Saskatchewan for pipeline installation. Three years ago after working in his family construction business, Ron Balzer, president of Accu-Pipe Ramming Systems, Inc., started in business as a specialty contractor. Balzar decided to use nothing but pneumatic tools in his business. "In these northern climates, the soil conditions change constantly and pneumatic tools give us the versatility that older conventional boring, such as auger boring methods do not. We can get the job done using different sizes of casing for the varying soil conditions." Grand Prairie, Alberta, located 250 miles north of Edmonton, is in the middle of forestry and oil exploration territory. The town has seen a growth spurt due to the development of the oil exploration and pipeline business. With new subdivisions going up, the town has had contractors laying the additional sanitary sewer infrastructure necessary for the expected growth. At the start of the project, on a Monday in early May, Accu-Pipe Ramming Systems Inc.'s crew prepared the site for the pipe ram. As it turned out, their methodical preparations and careful measurements were the critical steps that eventually resulted in a favorable outcome. The ram was to be done under an asphalt-paved entry road to the new subdivision. The critical grade to be achieved for the 30-inch casing was a minuscule .12 percent, which meant that the casing had less than a two-inch fall over a 100 feet. This tight tolerance demanded that all set steps, transit readings, and start-up procedures be extremely accurate. According to Curtis Metz, Accu-Pipe Ramming Systems, Inc.'s regional manager, the critical grade was nothing new. "There is not much difference between a 1 percent or .5 percent grade shot for pipe ramming in a casing. We were still as careful as we could be, but in this circumstance there was no leeway because of the ground conditions and the trunk line that the 24-inch PVC carrier pipe had to meet up with on the other side of the road. With the bell-end diameters on this carrier pipe reaching 27 1/2-inches, there was very little tolerance." The 50-foot long entry pit was excavated to accommodate the 40-foot sections of 3/8-inch thick walled steel casing. The plan called for three, 40-foot sections and a single 20-foot section to complete the required distance of the ram. The base of the entry pit was filled with gravel and 4x4 pieces of lumber were secured every two feet into the pit and were adjusted so the casings would ride on top of them at the precise grade. Since the top of the crosspieces would be the grade the pipe would ride on, there were numerous transit readings taken to make sure the grade was correct. Knowing that the tail end of the first section would be pressed down by the weight of the 23-inch diameter HammerHead Mole and its collets, the grade of the last few crosspieces were adjusted accordingly once the tool and collets were in place. Because of the careful precautions during this step, excavation, pit leveling, and setup took two full days, with laser transit measurements being taken constantly. When the pit was graded to everyone's satisfaction, the pipe sections, collets, and the 23-inch HammerHead Mole were lowered into the 5-1/2 meter deep entry pit. Accu-Pipe Ramming Systems, Inc. has used tandem pneumatic rammers in some situations where a smaller tool is used at first, so that the initial ramming proceeds slowly to maintain accuracy. However, the hard-packed clay dictated that the 23-inch tool be used from the outset. "The closest thing to the consistency of this hard-packed clay that I can think of, is cement," described Metz. "The jet spray people thought that it was tougher than the frozen ground they have worked on in the winter." Frequently, contractors have been known to consult what is referred to as an "N" value table to determine the penetrability of the soil. The table will give an "N" value of 10 for earth that is firm or, as is described in the table, penetrated by a person's thumb but with some effort. An "N" value of 40 on the upper end of the spectrum would describe earth that can only be penetrated up to 15mm with a penknife blade. The ground at Grand Prairie was characterized as having a high "N" value. In order to carve its way into this hard-packed earth, a soil shoe was welded onto the inside and outside of the lead pipe. Also, a 1/2-inch lube line was welded onto the pipe which would pump a combination of water and polymers to the lead casing. The welding of a lubrication line on to the top of each section of casing is considered by many pipe ramming contractors to be a necessary preparation step, especially in hard-packed clay conditions. Water and polymer are frequently mixed together, usually three to five cups of polymer for every 100 gallons of water, depending on the softness of the water and its temperature. Softer and warmer water mixes better and faster with the polymers on the market. Also, the amount of lubrication needed should not be underestimated. To calculate the theoretical minimum amount of lubrication needed, the area between the outside diameter of the soil shoe and the outside diameter of the pipe would be calculated, as well as the area between the inside diameter of the interior soil shoe and the inside diameter of the casing. This result is then converted to cubic inches and then to gallons per minute of lubrication per foot of ram distance that is achieved every minute. But contractors need to be aware that the theoretical minimum is just that - the minimum needed for the job. As a practical consideration, the lubricating liquid tends to run out of the pipe, towards the pneumatic tool, so more lubrication than the minimum would be required. In Grand Prairie, with 3/8-inch wall pipe, the area of the 30-inch diameter pipe would be the radius squared times pi, or 707 square inches. The area of the leading edge with the outside 3/8-inch soil shoe added would be 743 square inches. This difference, or 36 square inches, multiplied by 12 yields 432 cubic inches. Dividing this result by 231 cubic inches per gallon, a contractor would need 1.87 gallons per foot per minute for each foot being rammed. Although the inside soil shoe will have a smaller diameter than the inside diameter of the pipe, you can approximately double this value for inside soil shoe area. At a length of144 feet for the Grand Prairie ram, there would be a minimum of 538 gallons of water and polymer needed for lubrication. However, the gallons per minute must be adjusted for the pace of the ram. The gallons per minute pumping rate calculated above would be appropriate if you are ramming a foot every minute. If the ram slows down, you would adjust the pumping volume down, ram faster, and you would increase the volume. With the pipe and tool in place in Grand Prairie, more transit readings were taken at the front, middle, and end of the first casing section. "We wanted to be 100 percent sure of the grade before we started," said Metz. "It's too time consuming to be wrong once the pipe is in the ground." With the rear of the pipe section shimmed to compensate for the weight of the HammerHead Mole, the ramming started. Everyone on site was surprised at the performance of the HammerHead 23-inch tool in these tough soil conditions. "It took only 35 minutes to ram in the first 40-foot section," described Metz. "Which allayed any apprehensions we had about productivity in this dense, dry clay. The HammerHead Mole ramming tool performed up to its terrific past standards. We've rammed at locations all over the province and it has performed well every time." It took two days to reach the terminus of the ram. The total ramming time for the 144 feet of casing was approximately two hours with welding and set-up time for the additional sections taking up the remainder of the time. An exit pit was dug to depth to also the casing and receive the spoil from the jet spray washout process. When the last transit shot was taken, it revealed to everyone's surprise and delight that the ram had hit its mark. There were no more questions about what seemed, in the beginning to be extraordinary steps in the setup process. "We went in with the attitude that we had a difficult task, explained Metz, "and we took our time with the crucial setup steps. The outcome proved that it was worth it."